On Friday evening December 7, Downtown Asheboro will be filled with music, beautifully decorated floats and thousands of people all waiting for the Annual Asheboro Christmas Parade. The Asheboro Christmas Parade is brought to you by the Asheboro/Randolph Chamber of Commerce and the City of Asheboro. The Asheboro/Randolph Chamber of Commerce invites you to come out for an evening of family fun! The parade starts at 7pm. The parade route will begin at the corner of Church and Sunset Avenue, head east on Sunset to Fayetteville Street, then south on Fayetteville Street, ending at Kivett Street. 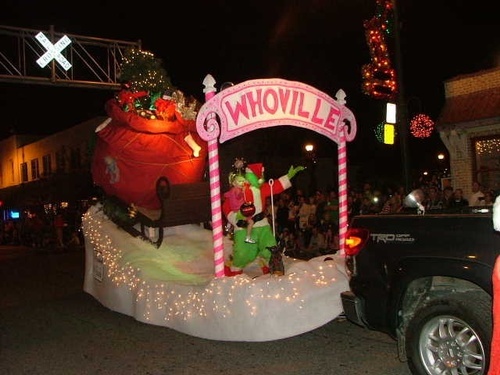 Floats, bands and Santa will join in making the Asheboro Christmas Parade the holiday event not to miss. Judges will be reviewing the entries from the Review Stand on Sunset Avenue. Cash prizes are presented to 1st, 2nd and 3rd place for Best Float and Best Band. There will also be an award to Overall Best Entry. Randy Lucas, former WKXR personality, will once again be the emcee. The streets of Downtown Asheboro will be alive with Christmas spirit and many of the Downtown shops and restaurants will be open for holiday shopping and eating. Come out early and bring the whole family for the festivities! Click here for application to register for the parade (Deadline: November 2, 2018).